With the Palestinian Grand Mufti, Haj Amin Al-Husseini, in the news, it's time to assess his role in fomenting pogroms against Jews in Arab countries and a genocidal antisemitism in Israel which is still with us today. Dr Edy Cohen, a Jewish refugee from Lebanon, who has a forthcoming book on The Mufti and the Jews, wrote this illuminating article for the Tower magazine. Al-Husseini’s next move was to Iraq, where he arrived on October 14, 1939. He quickly amassed a group of loyal followers in the Iraqi army and government. In Baghdad, he became the standard-bearer for anti-British and pro-German sentiments. At this time, Iraq was fertile ground for these trends, with many army officers anxious to free Iraq from its dependence on Britain. In January 1941, the pro-German Prime Minister Rashid Ali al-Gailani was forced to step down. With the active backing of al-Husseini, al-Gailani and a group of military officers staged a coup in April 1941. While the rogue government was quickly unseated by a British invasion, the troops couldn’t get to Baghdad fast enough to prevent the Mufti striking out at the largest Jewish community in Iraq. 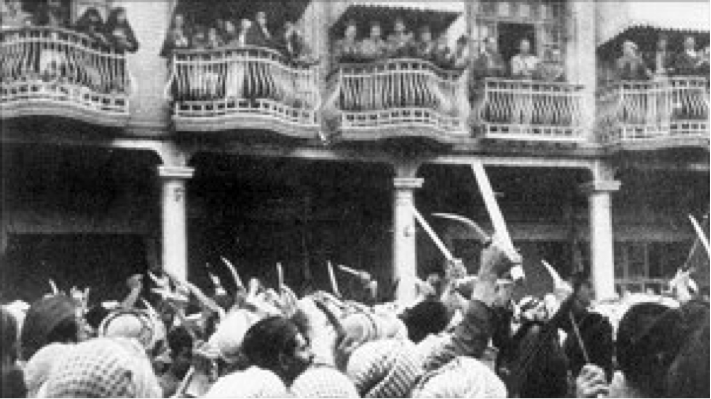 On June 1, 1941, during the holiday of Shavuot and a day after the Mufti’s hurried flight from Iraq, a pogrom against the Jews of Baghdad broke out. Known as the “Farhud”—a term which Edwin Black, the author of a major study of this horrific episode, translates as “violent dispossession”—the riots resulted in the deaths of nearly 200 Jews, with injuries to more than 1,000. Jewish property was looted and homes were burned indiscriminately. When the carnage subsided, a commission of inquiry was set up by the new, pro-British Iraqi government. Its investigation found that the Mufti and the Nazi propaganda broadcasts he made on Nazi-sponsored radio were the primary reasons behind the slaughter. The Mufti’s incitement against the Baghdadi Jews, said the commission, served to legitimize violence against them. In effect, the Mufti and his followers were directly responsible for the pogrom. These intrigues, al-Husseini insisted, triggered the Farhud. A far more credible explanation is that the Mufti, faced once again with exile, chose to take revenge on the defenseless Jews of Iraq. It should not be surprising that by the time he arrived in Berlin for his famous meeting with Adolf Hitler in November 1941, al-Husseini was regarded by the Nazis as their key Arab ally, a leader who could be installed as a collaborationist head-of-state in Palestine in the event that the German army triumphed in the Middle Eastern theater. Al-Husseini had spent over twenty years establishing precisely this position, and was in close contact with the Nazis after Hitler came to power in 1933 (in Iraq, for example, he worked closely with Fritz Grobba, the German Ambassador in Baghdad who went on to play a central role in Nazi propaganda activities throughout the Arab world and in Iran). 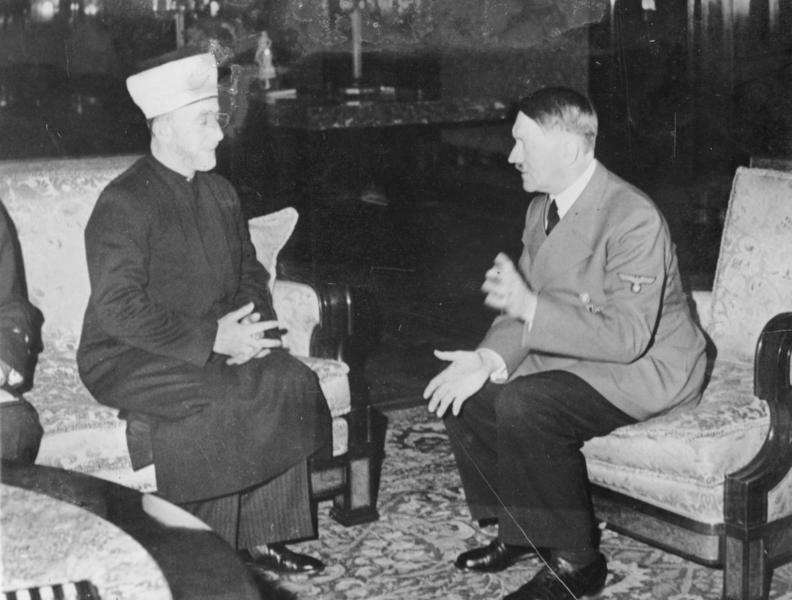 Significantly, the meeting with Hitler, during which both he and al-Husseini restated their commitment to the “elimination” of any form of Jewish sovereignty in Palestine, took place despite Nazi Germany’s recent invasion of the Soviet Union. This indicated the value the Nazis placed on their new ally. Indeed, the Nazis quickly appointed the Mufti as the head of their Arabic-language propaganda network. They gave him a monthly budget amounting to tens of thousands of dollars, an office, and dozens of employees who received their salaries directly from the Nazi foreign ministry. In his new role, the Mufti presided over Arabic-language broadcasts on Radio Berlin. As such, he broadcast a continuing stream of incitement and anti-Semitic propaganda in Arabic for the remainder of the war. He was also responsible for the dissemination of written propaganda in Arab countries, most of which was designed to spark riots against the British and French colonial rulers. The Mufti stayed in Germany until the Nazi defeat in May 1945; during this entire period was involved in espionage, sabotage, and terrorism. Throughout, he worked tirelessly for the expulsion and slaughter of the Palestinian Jews and the Jews of the Arab nations. The Versailles Treaty was a disaster for Germany and the Arabs. But the Germans know how to get rid of the Jews. What brings us so close to Germany … is that Germany has never caused damage to Muslims, and it fights against our mutual enemy—the Jews. But above all, they finally solved the Jewish problem for good. Time is working [against the Jews], even if the Allies are helping them. The end of the Africa campaign of the Axis powers should not obscure a central fact: in the special strategic situation that developed during the summer of 1942, Rommel’s Panzer Army Africa stood on the verge of a breakthrough into Palestine. The Germans had prepared for this scenario: with the Einsatzkommando under [SS-Obersturmbannführer Walther] Rauff and certain support that could be expected from the Arab side in Palestine, the mass murder of the Jewish population in mandatory Palestine could also have been put into high gear once that breakthrough occurred. Down to the present, this plan has not become part of public historical awareness. With the help of their influence, the Jews succeeded in ruling over England and America. The proof of this is the declaration that Congress recently passed, which allows the Jews to create a national home in Palestine. … The Jews exploited the last war to settle in the Holy Land. The Jewish danger is not only to Palestine, but all the Arab states, because the Allies intend to settle the millions of Jews expelled from Europe in the Arab nations. The Arabs must fight against this scheme with all their might and put an end to these plans. The Mufti was not satisfied with this, however. Despite the military defeats experienced by the Nazis in the Middle East, al-Husseini continued to plan the annihilation of the Jews of Palestine and the Arab nations. He spoke openly about expelling the Jews of the Arab nations, but in secret, he was planning something much worse. He was working behind the scenes to set up death camps for all the Jews of Palestine and the Arab nations. In effect, he was planning a Holocaust in the Middle East. Today, a chill runs through my body when I remember what was said in police circles and among supporters of the Mufti in those months [when German Field-Marshal Erwin Rommel was poised to invade Egypt in the summer of 1942]. Haj Amin al-Husseini was set to enter Jerusalem at the head of his aides, the soldiers of the Arab legion, which was formed out of Muslim soldiers in the German army. The [Mufti’s] master plan was to establish in the Dothan Valley, close to Shechem, giant crematoriums like Auschwitz, into which would be brought the Jews of Palestine, and the Jews of Iraq, Egypt, Yemen, Syria, Lebanon, and even North Africa, in order to slaughter them with the methods of the S.S. who operated in the death camps in Europe. Canaan said that he met with an elderly diplomat in Germany who told him, “I cannot say with certainty what was expected in regard to the Jews of the Land of Israel. But I know that their fate would have been bitter and horrific” had Rommel had succeeded in conquering the Middle East. Canaan’s sources added that after the German defeat at defeat in North Africa in 1942, the Mufti understood that the days of the Third Reich were numbered. As a result, he made additional plans: First and foremost the slaughter of the 250,000 Jews of Tel Aviv. According to his vision, the annihilation of these Jews would rouse the Arabs to rebel against the British in countries like Egypt and spark a holy war—a jihad. The Mufti’s “holy warriors” would then liberate the Arab states under British and French colonial rule. According to Canaan, the Germans invested significant funds in these plans, and even established bases and espionage stations in various Arab states. The plan, Canaan also asserted, was considered by top German military officials and the heads of the S.S., such as Heinrich Himmler, Herman Goering, and others. Although, thankfully, his plan never came to fruition, the Mufti’s industry of hatred and anti-Semitism did succeed in sparking significant anti-Jewish violence in many Middle Eastern countries. It is not a coincidence that on November 2, 1945—the anniversary of the Balfour Declaration—synagogues in Egypt were burned and dozens of Jews killed on the streets of Cairo. On the same day, the Jews of Libya were also attacked. Hundreds of them were killed and wounded, nine synagogues were desecrated and burned, and hundreds of Jewish houses, stores, and businesses were looted and torched. Clearly, the brutal attacks on the Jews of Egypt and Libya were the fruit of the Mufti’s efforts over half a decade to instill Nazism, anti-Semitism, and violence in the hearts of the Arab people as a whole. Nor were his activities restricted to North Africa. In the western Balkans, he raised three SS divisions composed of Bosnian and Albanian Muslims who participated in the killing of Jews in Croatia and Hungary. Once the war was over, the Yugoslav authorities sought al-Husseini’s arrest for war crimes—as so often in his career, in 1946 he escaped French detention this time and traveled to Beirut. In return for the Balfour Declaration, the Jews took it upon themselves to serve the British and their policies, and to invest their best efforts so [the British] would win the war. For this reason, the Jews played a central role in sabotage and destructive propaganda in Germany at the end of World War I. This is the fundamental reason for Hitler’s war against the Jews and his intense hatred for them. They brought down disaster on Germany and caused its defeat in World War I. His opposition to Jewish immigration was expressed in the letters he sent to the foreign ministers of various Axis powers. Two of these letters were presented at the 1961 trial in Jerusalem of Adolf Eichmann, one to German Foreign Minister Joachim von Ribbentrop and the other to his Romanian counterpart. this post shows a photo of Husseini meeting hitler in Berlin in November 1941. The link below goes to a post which links to a video of the mufti Husseini arriving at the meeting and giving the Nazi salute, the upraised right arm, as he walks along. The narration of the film is in French. It was probably intended for use in occupied and Vichy-controlled parts of France. Is Kurdish-Jewish director an Iranian agent? Editor: "Jews are only safe under Arabs"